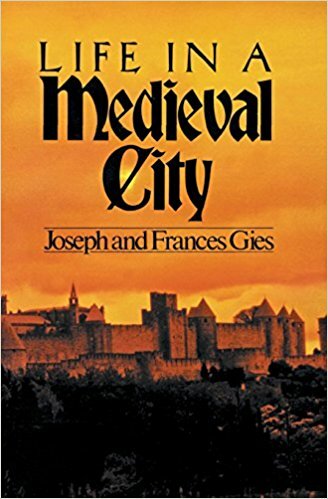 Joseph and Francis Gies’s “Life in a Medieval…” series is a useful series for gamers. I’ve just finished reading Life in a Medieval City and it provides details that should inspire ideas both for characters and for creating adventures. The Medieval City of the title is, basically, Troyes, around the year 1250, in what was then only sort of France. The king of France didn’t control the Champagne area; the Count of Champagne ruled over the Province of Champagne, and Troyes was its capital.1 Nor was it the only area not under the control of the King, and Champagne itself was potentially under several jurisdictions. Language was fragmented as well. The literate used Latin as a common language—sometimes. The rest did as best they could with widely variant versions of French. In a fantasy game, of course, scholars have a very good reason for not investigating monsters at the source: the monsters are real, and it’s dangerous to investigate them. Which could make for a lot of fun when the encyclopedias don’t match what the monsters actually do. Troyes was the major fair town in an area known for its fairs, and the authors take us through the kind of people who take part in the fairs and how they do it. As with Life in a Medieval Castle, they cover not only how the fairs grew, but also how they faded. Troyes had a hot fair in the summer and a cold fair in the late autumn. Several other fairs in the area kept merchants in business throughout the year, traveling throughout Champagne. The large number of well-traveled fairs meant that merchants from outside the area came to Champagne—from Italy and Germany and England, crossing the alps or following the Seine or the old Roman roads—and so there was good business for money-changers and translators. The standard coin of the fairs is the denier de Provins (Provins penny)… But dozens of other pennies of widely varying worth also put in an appearance. Moneychanging is governed by strict regulations. One ironclad rule directs the changer to remove from circulation all debased or false coins. Exchange rates on all kinds of money are posted, the quotations made in terms of one sou (twelve pennies) of Provins. That’s my own emphasis. A rule like that could mean that money found in dungeons would have to be laundered by illegal means before it could be used at the fairs. But the moneychangers’ function at the fair is not limited to providing a standard medium of exchange for the merchants’ use. They are also the focus of a very extensive system of credit. This operates in several ways. A certain Florentine house is a regular purchaser of cloth at the fairs. But the company’s cargoes of spices and luxury goods, which they sell in Champagne, do not always arrive on time. Therefore they keep a balance to their account with the moneychangers so that their agents are never without funds. Further, they can deposit Florentine money in Florence or Genoa and have the money paid to their agent at Troyes in silver of Provins. The section on how the growth of fairs fed the growth of what was basically paper money is especially interesting, partly because it also helped reduce the need for the fairs. An ever more complex financial system is taking shape… [making] it possible to execute a considerable proportion of the fair’s business without recourse to the moneychangers, and without the need for handling large sums of cash. Thus in the cheerful clamor of the fair, the jingle of silver is quietly being replaced by the rattle of the abacus and the scratching of the quill, turning bales and bolts into lives and deniers, and recording them in notarial documents. The growing financial sophistication evident at the Hot Fair of Troyes in the year 1250 led in succeeding decades to a paradox not uncommon in history. The Champagne Fairs became so successful that they made themselves obsolescent. The fairs were so important that merchants were protected by the local rulers, and if they were robbed en route to a fair, it was the ruler’s duty to reimburse them. That, too could inspire some nice adventures, because some of this protection takes place in special courts. Merchants are not only protected from bandits and robber barons, but from each other, and in fact today this is the more important protection of the two. Crimes committed at the fair are answerable to special courts, under the supervision of the Keepers of the Fair, but both town and provost try cases, too, and law enforcement becomes a lively three-way competition. Whichever court tries the case gets part of the fines. So everyone wants a piece of the action, from Thibaut through the local clergy and city officials and down to the Keepers of the Fair and even the individual guilds. Like Life in a Medieval Castle, this is an easy read filled with great ideas for world-building and town encounters. In response to Life in a Medieval Castle: A fascinating, all-too-short book of just what it says: the day-to-day and year-to-year life in a medieval castle. Though, at least once in the past, the Count of Champagne had also been the King of France. A fascinating, all-too-short book of just what it says: the day-to-day and year-to-year life in a medieval castle. Life in a Medieval City last modified April 11th, 2017.